In small bowl, mix apple juice, powdered sugar, cinnamon and salt. Gently place 2 or 3 biscuits in hot oil. (Biscuit holes can also be fried!) Fry doughnuts on one side until golden brown. Gently turn with tongs; fry until other side is golden brown. Immediately dip doughnuts in glaze; place on cooling rack. Cool 3 to 5 minutes or until glaze is set before serving. To make cinnamon-sugar doughnuts, combine 1/2 cup of sugar with 1 teaspoon of ground cinnamon. 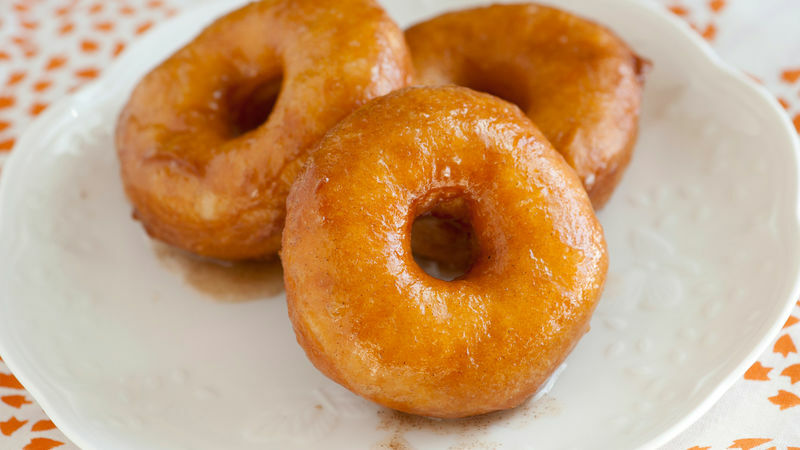 Dip warm doughnuts into cinnamon-sugar and turn to coat. Don’t forget the doughnut holes. Fry separately until golden brown, then dip in glaze.